I was in Costa Coffee, the manager was taking orders and two baristas were making the coffee. 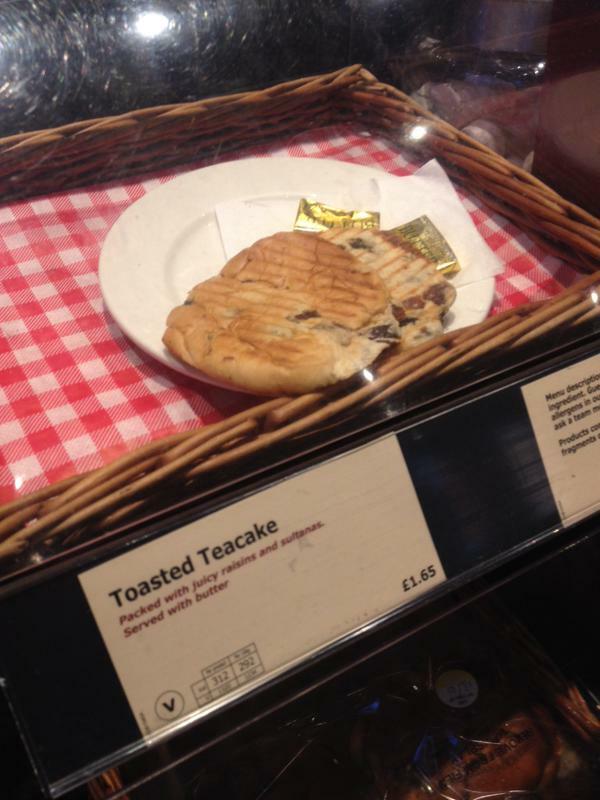 Incidentally (to this story), whilst waiting I couldn’t help noticing the rather unusual way in which they had chosen to promote their toasted teacake (see image). I waited some time for my order – two flat whites – and observed that the baristas seemed to be engrossed in conversation, oblivious to the queue of waiting Customers behind them. Eventually, the first flat white was delivered to my tray: I noticed it was not very hot, and that instead of the usual leaf/heart/animal design on the top there were a few wispy streaks of milk. “Sorry about the pattern,” said the barista – and then I realised that she was in training, and that the delay was caused by the fact that she was learning how to make the perfect flat white. “No worries,” I replied, “it’s abstract!” Her response was to look at me quizzically before returning to her task. Soon the second flat white was presented, and the accompanying whoops heralded a definite leaf pattern on the top! The celebrations, now involving the manager too, were brief but heartfelt, and I smiled at sharing in the moment. Oddly, though, I had a sense of not being included – even though I had waited patiently for the uneven duo of beverages – and this sense was heightened as the trainee took out her mobile phone and took a photo of her creation, just remembering to ask (unsmiling) “Do you mind?” before she did so. In his book Put Your Heart Into It Howard Schultz (the CEO of Starbucks, not Costa) expressed his philosophy, that the Customer Experience is made “one cup at a time”, and so it was for me today. Schultz demonstrates his commitment to that philosophy by visiting 25 Starbucks stores every week. Such dedication – such Leadership – truly creates the culture where a Team triumph is naturally shared with the Customer, and not played out in front of them like a movie. For advice and support to create sophisticated and profitable Customer Experiences, click here. Previous No Training? No Gaining! Your experience is another great example of a lack of understanding by the service providers that including and exceeding customer expectations is everything. I visit two Costa restaurants in my area and although they do “engage” occasionally, the service is inconsistent. This suggests there is no structured customer service training for its team members.